There are 23 Timber Frame houses at Drumcoura Lake Resort and most of these are available for rent from their individual owners who have their own websites. They all sleep 6 people comfortably in 3 large bedrooms. There is a minimum stay of 2 nights (towels are not provided). The rental cost is as follows: 2 nights for €285.00, 3 nights for €385.00 (€21.39 per person per night for 6 people), 4 nights for €485.00, 5 nights for €585.00 (€13.93 per person per night for 6 people). Enjoy life as it should be with beautiful surroundings of an upspoilt countryside and idyllic lakes. While Drumcoura is stress free, it also offers activities to suit all family members. Drumcoura Lake Resort has an Equestrian Centre specialising in Western Horse Riding. It has the largest covered arena in the county, two outdoor arenas, horse riding trails, an archery range, an outdoor tennis court and a jetty with fishing and row boats on Drumcoura Lake. Drumcoura also has a fully licensed bar and family restaurant just as you would see out West in America. It is called the DC Saloon with swinging doors and loads of pictures of Cowboys and Indians. Continuing the Western theme, Drumcoura has authentic log houses for rent as well as more recently built timber frame houses. Planning permission has been requested for a leisure centre with a gym, handball court and pool. This is the break you deserve. 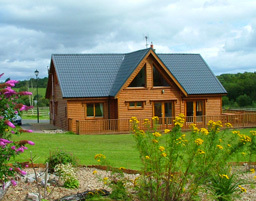 Come stay with us in the Leitrim Countryside for a weekend break or for an entire week. If you have ever dreamed about riding an American Quarter Horse like the ones in the Western films, this is the place for you. Our horses are well trained and even beginners will learn the ropes with a few lessons. Our head Western Riding Instructor, Ron Weisz, holds a level 2 certificatiion from the Western Equestrian Society in conjucntion with Horse Sport Ireland Western and Reining Section and he is the Chairman of The Irish Quarter Horse Association. The Riding facility is approved by AIRE (The Association of Irish Riding Establishments) and Failte Ireland Tourism.